Cinerusi are a unique species of phoenixes, born only once a year. When the moon reaches its fullest, these birds lay eggs that are only able to live if given life through flame. Cinerusi spend all year creating nests that are woven with powerful spells. At midnight of the new year, these nests ignite and the eggs within are gifted with life. This is how new phoenixes are created, and fully grown cinerusi birds undergo a birth much the same. Every thousand years a cinerus is consumed in fire and reborn, to live again with its youth restored. 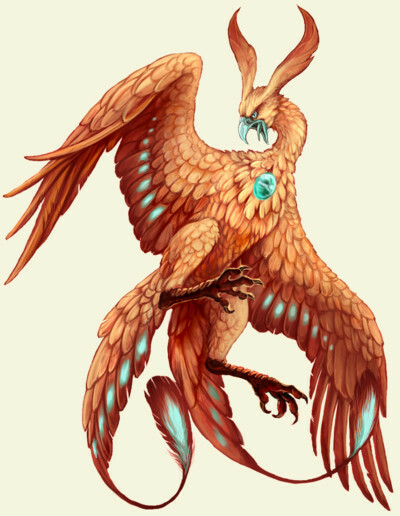 No one knows how long phoenixes are capable of completing this cycle – these birds have never had a natural death; they have only met their end in combat. Because of their long lifespans, new phoenixes do not often come into existence, and indeed their numbers are dropping. So it is that these huge birds have aligned themselves with the magi, so their race can become replenished and their numbers can grow once more. This pale egg has a blue gem in the center. You wait breathlessly in front of an egg, watching for the appearance of another crack. You have been waiting some time for this hatchling; cinerusi are only born once a year, and have become rare of late. That you have come into possession of one of these creatures is both exciting and frightening, because these hatchlings are difficult to care for. This race of phoenixes has been decreasing, and so you feel the need to raise a healthy cinerus strongly. They need constant attention and require a complex diet. Your attention is brought back to the egg by a sharp sound. Your eyes widen as another break in the shell appears, and a small but wickedly sharp beak emerges. Soon enough you are busily arranging your newest companion in a nest and fetching it food, a smile spreading across your face. The bright hatchling soon falls asleep, talons tightly gripping a corner of your robe. It is well known that one of the most potent of companions is a cinerus. They are extremely powerful, and often help in casting spells. Their magic boosts the abilities of their magi companions, and together the two are a formidable team. It is believed that phoenixes deal with the magic of life, arguably one of the most powerful elements. The earliest stories of phoenixes tell of a time when all creatures were immortal, capable of living forever. But into this world crept death, and the number of animals began to fall. To combat death, the power of life became stronger and creatures were given the gift of life. Phoenixes, however, were given more of this new power than others, and they alone were untouched by death. Others could end their lives, but they would otherwise remain immortal.